This is the last part of the series. I will be showing you how to setup Sharepoint 2013 Enterprise. The only difference is that your databases (configuration, content, user profiles, etc) will be residing in a highly available SQL 2012 Enterprise AlwaysOn group. Installing Sharepoint 2013 is a breeze. If you have taken care of the prerequisites, you should be able to install Sharepoint 2013 Enterprise without any problems. 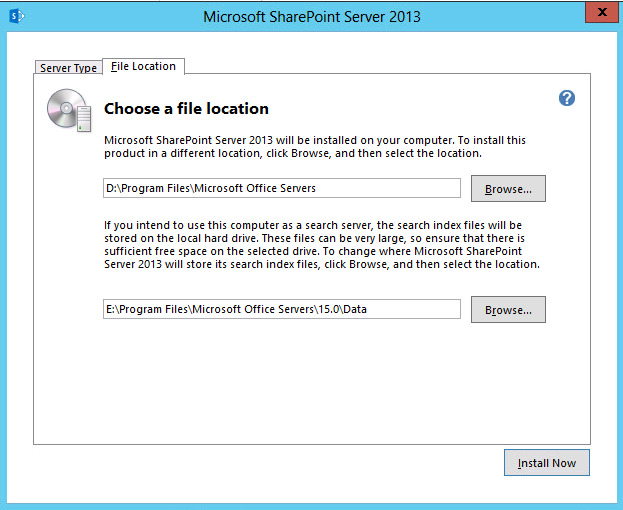 I will not go in detail on how to install Sharepoint 2013 Enterprise. There are a lot of blog posts covering this subject. What I will do is explain some little things that you need to keep in mind, during the installation of Sharepoint 2013 Enterprise with a Microsoft SQL 2012 Enterprise AlwaysOn Availability group as the backend database infrastructure. Step one – mount the .ISO file and type your key in. 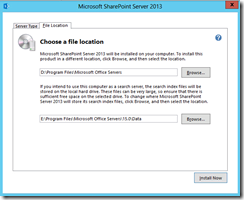 The best practice is to split the location of the Sharepoint 2013 binaries and other files. After you have done this, you can press the big install now button. 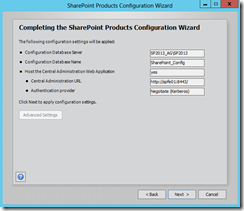 Once the setup has completed, the Sharepoint 2013 Product Configuration wizard will start. Let the fun part begin. Database server: Your Availability group listener DNS Name + SQL Server Instance. 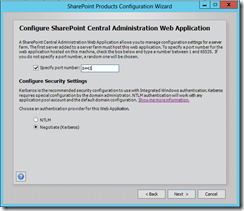 The SQL server instance is NOT a requirement for Sharepoint. 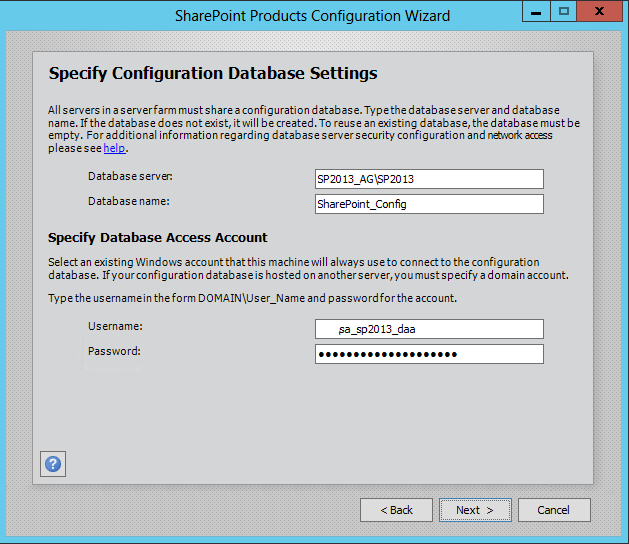 It’s just a neat way to segregate databases on a Microsoft SQL 2012 Server. 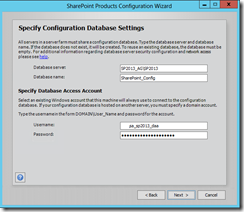 Database Access Account must be an Active Directory user account with enough access rights to the database server. Once everything is filled in, proceed by clicking on “Next”. Here you specify the Farm Passphrase. 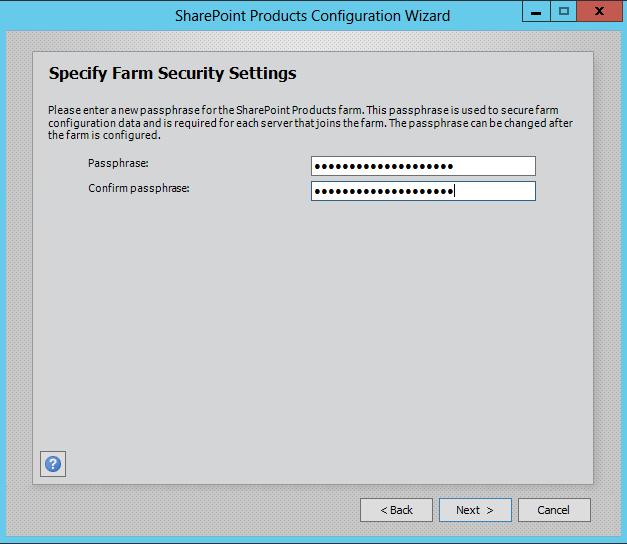 This passphrase is needed to join new Sharepoint 2013 servers to the Sharepoint 2013 farm. It’s important to save this passphrase in a password manager program. Press “Next” to continue with the setup. 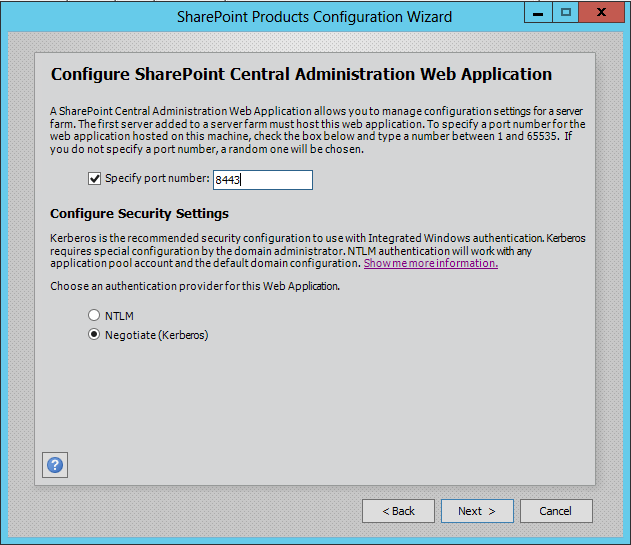 At this point you are almost done with the Sharepoint 2013 initial configuration. You have to specify a http port that will be bound to the Central Administration webpage. Then you have to make a crucial selection here. Do I go for NTL security (easy to implement, but less secure) or do I go with Kerberos. I went with Kerberos Authentication, because I had business requirements to follow. Once you have decided which security setting you want, you can proceed by clicking on “Next”. 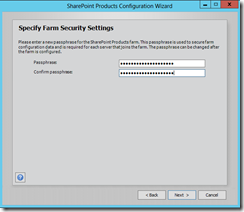 Click “Next” one last time and the Sharepoint 2013 Farm will be configured. 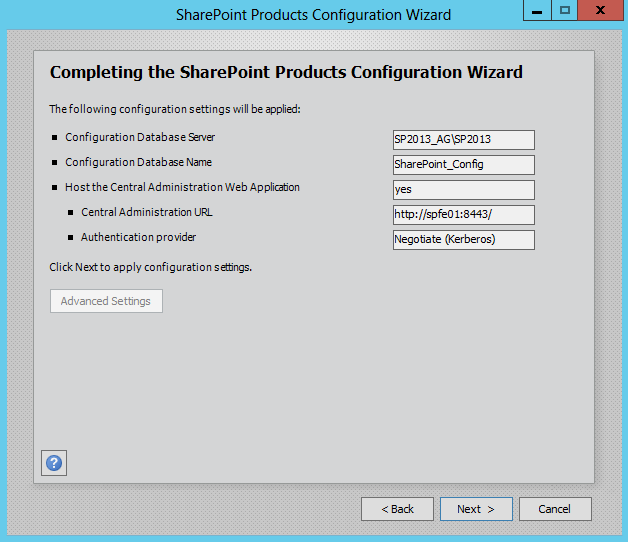 At the end, the Sharepoint Products Configuration Wizard will open the Central Administration webpage and you can begin fine tuning your Sharepoint 2013 environment. I hope you enjoyed my previous blog posts (part 1 and part 2) and that I saved you many hours of troubleshooting. As for myself, I have enjoyed blogging about Sharepoint and Microsoft SQL 2012 AlwaysOn Availability group. I will continue to blog about Sharepoint, Exchange, Lync and other Microsoft products. Feel free to drop me a line on twitter. If you have questions or comments, please feel free to contact me via Twitter (@SMKappel).